Making sure you don’t send bad leads to your clients is no easy task. So how can you build a winning Lead Distribution system that ensures you never send bad leads to your customers? ClickPoint Software’s flagship product, Leadexec has made it easy. LeadExec will validate and score your lead data, give you real time scoring and lead grading results, validate your lead fields in real time, and even provide you with a dialing solution to voice verify leads. We are strong proponents of sampling your leads by using a power dialing solution to call verify your leads in addition to scoring them. All of this can be done within one easy to use, easy to program interface. LeadExec will verify critical lead data like Address Deliverability, Phone Number Verification, Reverse IP Lookup, and Email Verification. ClickPoint’s LeadExec Software integrates with a third party verification service and takes the guesswork out of figuring out how to build your own integration. We have even gone one step further and attached the Lead Verification Service to a Scoring Model. Our Lead Scoring system will allow you to enable or disable verifications at the click of a button. You can assign a score value to your leads in both a high and low numerical range. Then you can assign a grade letter to the lead A-F. You decide with LeadExec what is worthy of an A or B grade by matching up scoring checks to grade ranges. So, now that you have scored your lead, what do you do with it? 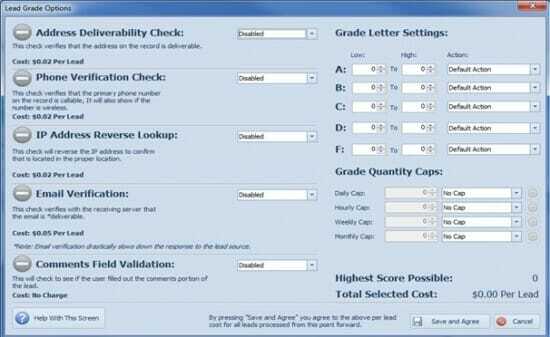 Naturally an A or B graded lead is high quality, just like the grades from our Report Cards in School. C and D graded leads might be passable, but clearly there is room for improvement. An F graded lead, well; nobody wants to see an F, especially your customers! LeadExec’s Grading System will let you assign actions to your Grade Letters taking the guesswork out of your lead distribution. Clearly, all of your A and B leads should be delivered directly to your clients. C and D leads can be flagged (quarantined) and sent to a Quality Control Environment, and F leads can be automatically rejected. So what happens next? Your A and B leads will send through your Lead Distribution system to be delivered to your Client’s delivery accounts all within a matter of seconds. Your C and D graded leads will be sent to a Quality Control Bin for you to validate or invalidate. There is a “Mini Call Environment” built within LeadExec that will allow for a simple VOIP integration. You will be able to “Round Robin” dial leads to manually Voice Verify the Lead Data and then send the lead directly through the system. With LeadExec’s VOIP integration, you also have the option to complete a “Hot Call Transfer” of the lead to your client. 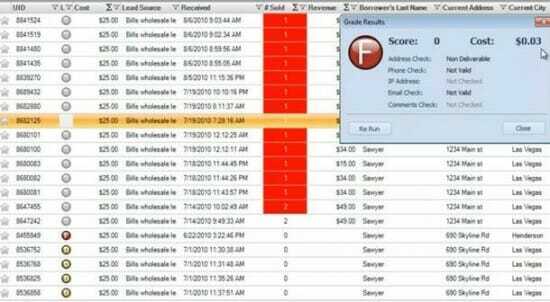 The Lead Scoring system also ties into the Reporting Suite within LeadExec. 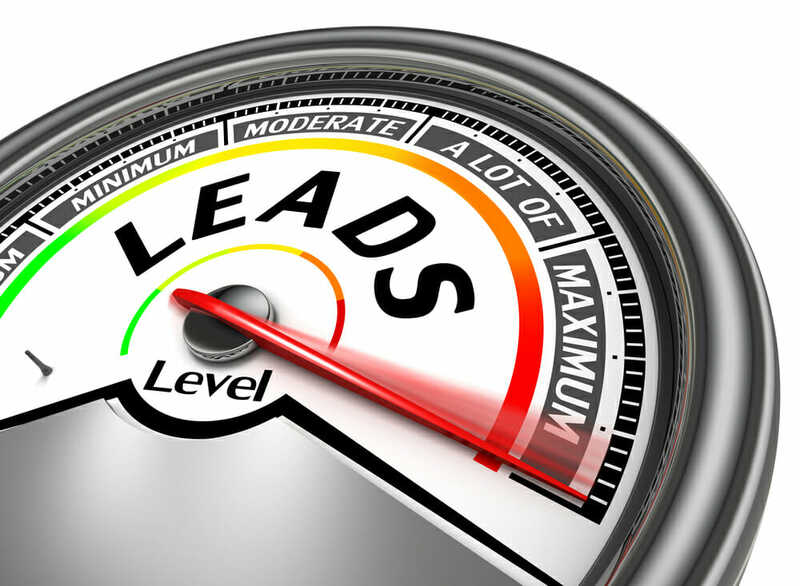 You will be able to view the quality of leads coming from your Lead Sources in real time. You can also view all of the historical data of leads coming into your distribution system. This will allow you to “Grade” your Lead Sources and uncover historical trends within your Lead Distribution Process. The best part of LeadExec’s Grading System is that it is completely customizable by you. You can designate which criteria must be met for each grade level. You are also in control of what Lead Sources and/or Campaigns you want to run the Lead Scoring on. You can create a master Lead Scoring default to place on your account and then very easily assign that default to individual campaign. Or you can be more granular with your scoring system and create specific scoring for each and every Campaign that you are running. What do the industry experts feel about the importance of Lead Scoring? Lead generation was the number two marketing pain for CMOs in the Aberdeen study, The Convergence of Sales and Marketing Technologies. All companies are pressured to maximize sales and marketing effectiveness to increase conversion, increase lead to sales revenue, and increase top-line revenue. Prior Aberdeen research isolated some of the key challenges organizations face with respect to lead management: marketing and sales alignment, technology adoption, and organizational accountability and ownership. This study explores the strategic value of lead scoring and prioritization techniques and isolates the processes, capabilities, and technology enablers that allow Best-in-Class organizations to achieve superior performance in revenue, lead conversion rates, and cost per lead. Based on independent market research, 79% of B2B marketers have not established lead scoring. Making sure that you send qualified and verified Leads to your customers is an essential part of any successful Lead Distribution Process. LeadExec will allow you to accomplish this task easily and quickly. ClickPoint Software enables our clients to focus more on generating profits instead of focusing on the process of managing your Lead Distribution Software. The Lead Scoring System is just one piece of our solution that is integral to ensuring that you have a winning Lead Distribution System in place. This entry was posted in Business & Life / Lead Generation System / Lead Management Software and tagged address deliverability, call transfer, lead distribution, Lead Distribution System, lead generation, lead grading, lead scoring, lead scoring system, phone number verification, round robin lead delivery, round robin lead distribution, sending qualified leads, validate leads on October 18, 2017 by Gabriel Buck.